This comprehensive cattle health handbook is a must-have addition to your ranching library - one you will consult many time throughout the course of the year! It strikes the right balance between theory and practical hands-on tips to make it easy to understand and extremely practical. It is an invaluable asset for cattle owners of all sizes, from commercial ranchers to small-scale hobby farms. From the Publisher: The Cattle Health Handbook is the essential medical reference for farmers and ranchers confronting day-to-day bovine health issues. Heather Smith Thomas, an expert on livestock with decades of first-hand experience, covers every routine situation — and many not-so-common problems — likely to arise on a cattle ranch or dairy farm. Three broad sections cover common diseases, ailments specific to certain body systems, and other ailments and injuries. Beginning with detailed information on how to detect signs of illness, the book progresses through the various causes of cattle health problems, describing symptoms and discussing prevention and treatment. Readers will find reassuring advice on handling bacterial and viral diseases; digestive and respiratory problems; eye, skin, foot, and mouth irritations; injuries and wounds; and much more. Thomas also helps farmers recognize when a situation calls for veterinary assistance. Case histories, real characters, and humorous anecdotes give the text a warm voice of authority. 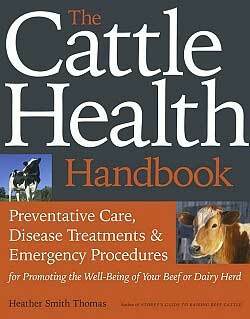 Have you read The Cattle Health Handbook? Share your review in the Comments section below!